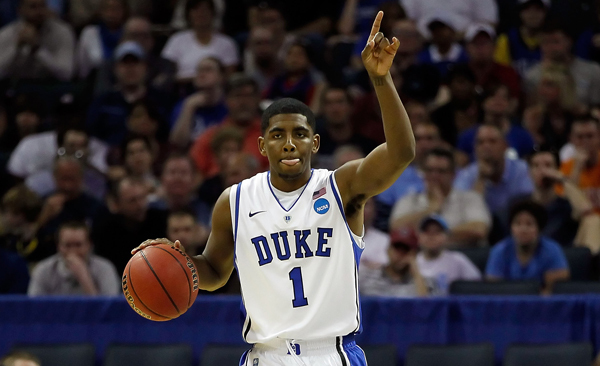 Number one draft pick Kyrie Irving will begin his much anticipated NBA career with the Swoosh on his feet. Taking to his Twitter account to share the big news, Cleveland Cavaliers number one draft pick Kyrie Irving has announced that he's officially signed an endorsement deal with Nike Basketball. 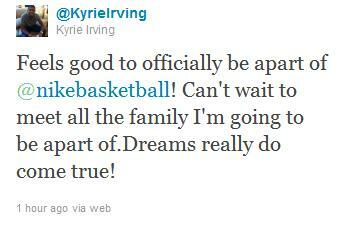 Coming as the first big name out of the 2011 NBA Draft to sign with the Swoosh, Irving expressed his excitement via Twitter, the same way in which Kemba Walker announced his sneaker deal earlier this month. Irving also went on to say that he's excited to meet the entire Nike Basketball family soon, and that dreams do come true. Although not likely to receive a signature line with Nike, it'll be interesting to see Kyrie's choice of footwear from the Swoosh once he makes his official NBA debut. He was seen wearing the Zoom LeBron Soldier IV during his freshman year at Duke, but could we possibly see the new face of the Cavaliers franchise hit the court in some LeBron gear? Hit the comment section below and be sure to let us know your thoughts on Kyrie Irving's recent deal with Nike Basketball.